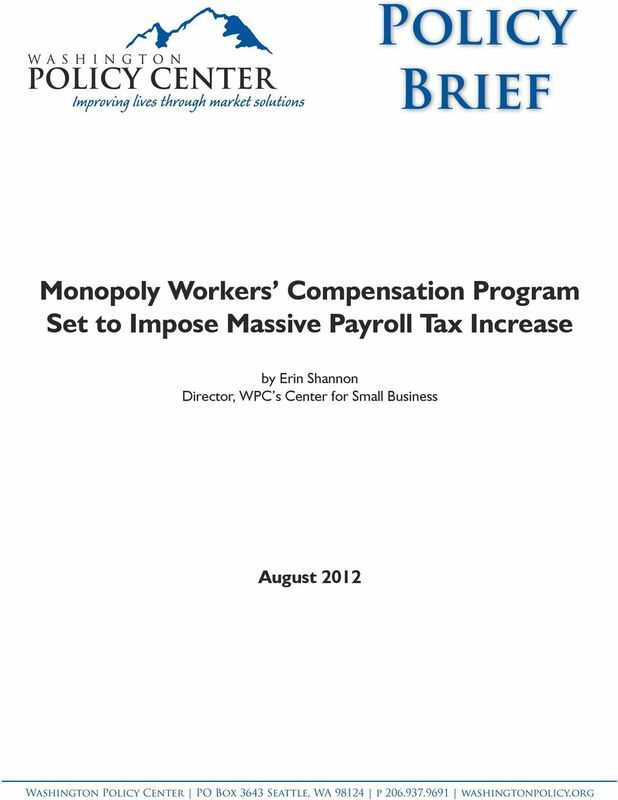 Download "Monopoly Workers Compensation Program Set to Impose Massive Payroll Tax Increase. 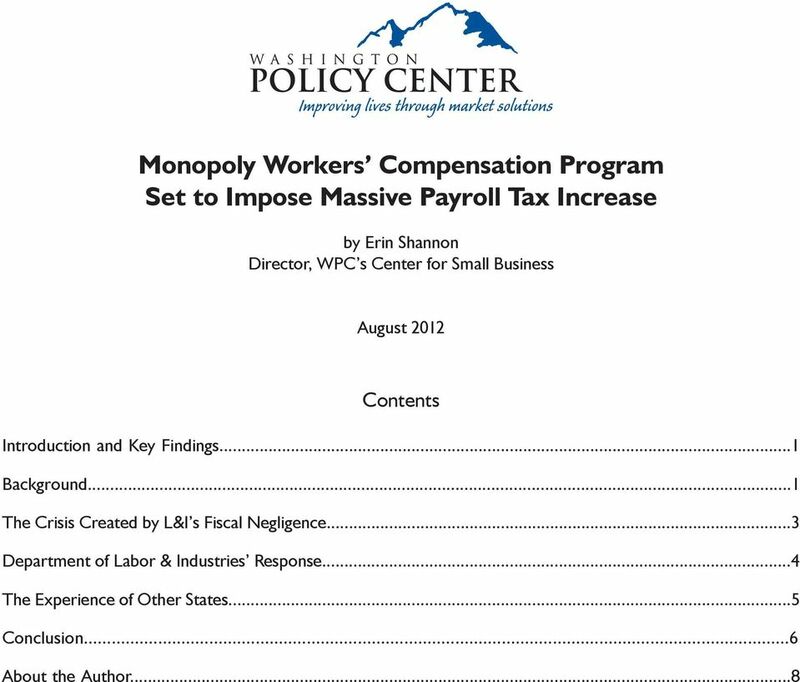 by Erin Shannon Director, WPC s Center for Small Business"
3 POLICY BRIEF Monopoly Workers Compensation Program Set to Impose Massive Payroll Tax Increase by Erin Shannon Director, Center for Small Business August 2012 Key Findings 1. Employers in Washington face a workers compensation tax increase of 19% or more every year until Washington is one of just four states that do not allow private insurance. 3. L&I developed 24 possible scenarios that phase in the higher taxes over various lengths of time; the proposed tax increases would be in addition to regular annual increases. 4. 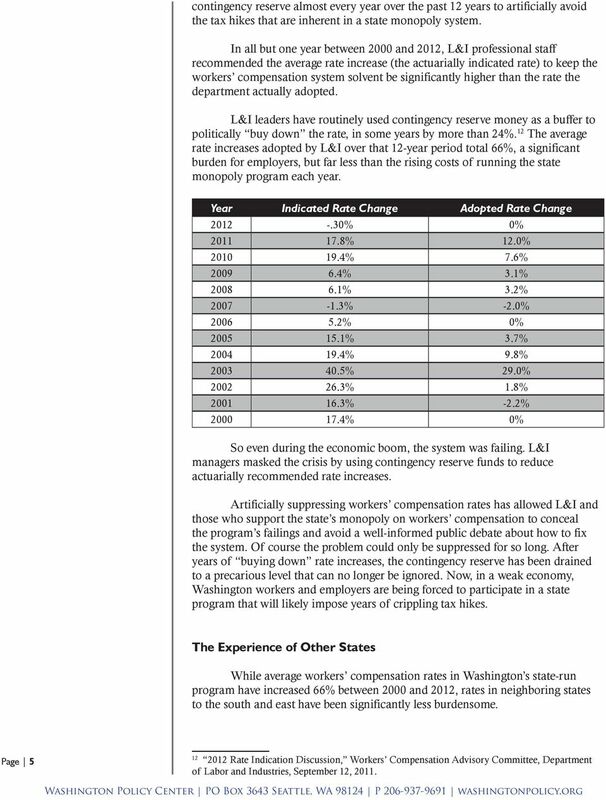 Even during the economic boom, the system was failing; L&I managers masked the crisis by using contingency reserve funds. 5. Employers in Washington are at a severe competitive disadvantage in workers compensation costs compared to other states. 6. The state should close its monopoly insurance program and let employers buy worker coverage in the private market at competitive prices, as employers in 46 other states are free to do. Introduction On June 21, Washington State Department of Labor and Industries (L&I) officials reported that the state-run monopoly workers compensation system faces a budget shortfall of $3.1 billion. (The sale of private workers compensation insurance is illegal in Washington.) In order to close the gap and prevent insolvency of the workers compensation contingency reserve fund, the department would need to impose a rate surcharge of 19% every year over the next 10 years. The 19% payroll tax increase would be in addition to whatever annual rate increases the department may impose each year to cover inflation and increases in workers compensation costs. 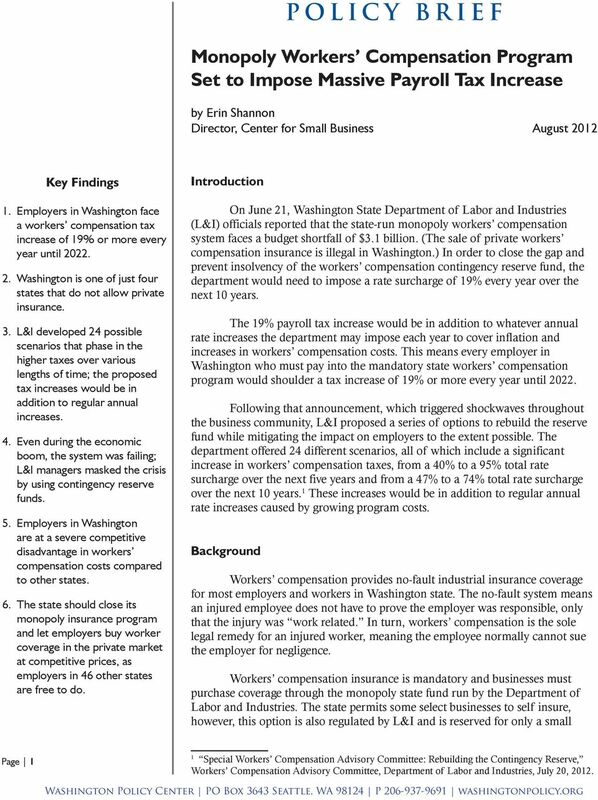 This means every employer in Washington who must pay into the mandatory state workers compensation program would shoulder a tax increase of 19% or more every year until Following that announcement, which triggered shockwaves throughout the business community, L&I proposed a series of options to rebuild the reserve fund while mitigating the impact on employers to the extent possible. The department offered 24 different scenarios, all of which include a significant increase in workers compensation taxes, from a 40% to a 95% total rate surcharge over the next five years and from a 47% to a 74% total rate surcharge over the next 10 years. 1 These increases would be in addition to regular annual rate increases caused by growing program costs. Background Workers compensation provides no-fault industrial insurance coverage for most employers and workers in Washington state. The no-fault system means an injured employee does not have to prove the employer was responsible, only that the injury was work related. In turn, workers compensation is the sole legal remedy for an injured worker, meaning the employee normally cannot sue the employer for negligence. Workers compensation insurance is mandatory and businesses must purchase coverage through the monopoly state fund run by the Department of Labor and Industries. The state permits some select businesses to self insure, however, this option is also regulated by L&I and is reserved for only a small Page 1 1 Special Workers Compensation Advisory Committee: Rebuilding the Contingency Reserve, Workers Compensation Advisory Committee, Department of Labor and Industries, July 20, 2012. 4 number of large businesses. The state-run system covers 2.3 million workers and 163,000 employers. Washington is one of just four states that do not allow private insurers to compete for the workers compensation coverage employers must have in order to do business legally. The workers compensation coverage employers are forced to buy from the state provides medical and wage replacement payments to workers who experience a job-related injury or occupational illness. State officials manage all injured worker claims and pay medical, time-loss, pension, retraining and other benefits from an account called the Washington State Fund. The Washington State Fund run by L&I consists primarily of three smaller accounts: The Medical Aid Account, the Accident Account and the Pension Reserve Account. The Medical Aid Account pays for medical care and related services The Accident Account pays non-medical claim costs, such as wage replacement benefits, vocational rehabilitation, disability pensions and survivor benefits The Pension Reserve Account pays benefits to all permanently disabled employees The Pension Reserve Account is not funded by premiums. It is funded through contributions and transfers from the Accident Fund and from selfinsured companies. Because of the way the Pension Reserve Fund is financed, its solvency is maintained as long as the accident fund and the self-insurance program remain solvent. The Medical Aid and Accident accounts are funded by payroll taxes paid primarily by employers and, to a lesser extent, by workers. The contingency reserve is the difference between the Accident and Medical Aid accounts combined total assets and total liabilities. Maintaining adequate reserves is important to cover unexpected losses as well as shortfalls in premium and investment income. When the contingency reserve falls below zero, the fund is insolvent because liabilities exceed the value of assets. State officials are required by law to reduce program costs or collect taxes to maintain the contingency reserve at a level that ensures the solvency of the Medical Aid and Accident accounts. 2 According to the state auditor, contrary to state law, L&I department officials have consistently failed to comply with this requirement. 3 L&I policy is to maintain the contingency reserve fund at 19.2% more than the amount needed to cover current liabilities. This is the midrange of the target, with 29.7% being the top of the range and 8.7% being the bottom of the range. Currently the contingency reserve is at 5.2% of liabilities. Page 2 2 Revised Code of Washington , Classifications Premiums Rules Workers compensation advisory committee recommendations, at apps.leg.wa.gov/rcw/ default.aspx?cite= Financial Statements and Actuarial Reviews Audit Report, Worker s Compensation Program, Report No , Washington State Auditor s Office, December 30, 2010, at auditreports/auditreportfiles/ar pdf. 5 The Crisis Created by L&I s Fiscal Negligence In 2009 the state auditor warned the contingency reserves for both the Accident and Medical Aid accounts had declined substantially and the Accident Account faced an 89.5% chance of insolvency within five years without a significant rate increase. 4 The SAO report identified insufficient premium rates in recent years as one of the primary drivers in the decline. L&I director Judy Schurke dismissed the auditor s findings that the state s monopoly workers compensation system was at risk of insolvency. Schurke said the state-run system is not at risk of going insolvent and that characterizing it as such is wrong. Schurke downplayed the auditor s findings: The last thing we need to do is overreact to the possibility that the contingency reserve is low. [L&I] made a deliberate decision to draw down the contingency reserve in order to keep premiums low and help businesses keep their doors open in this tough economic time. 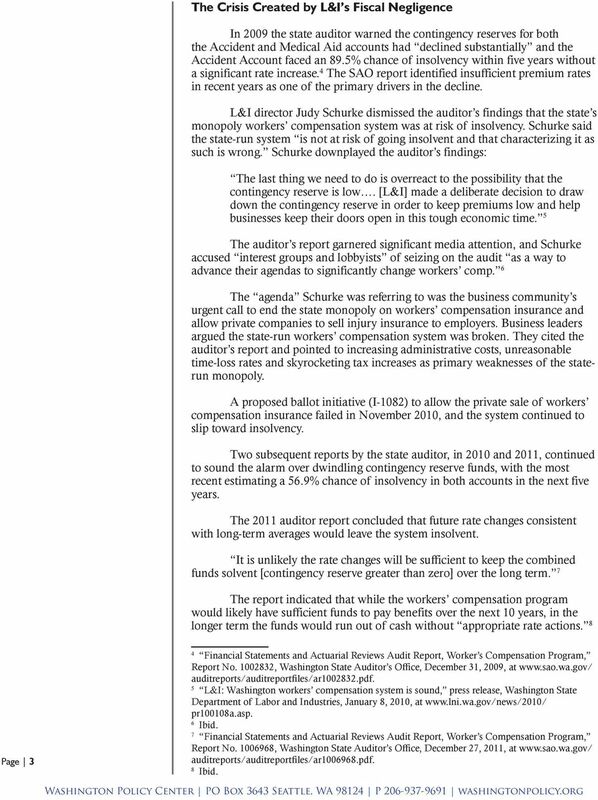 5 The auditor s report garnered significant media attention, and Schurke accused interest groups and lobbyists of seizing on the audit as a way to advance their agendas to significantly change workers comp. 6 The agenda Schurke was referring to was the business community s urgent call to end the state monopoly on workers compensation insurance and allow private companies to sell injury insurance to employers. Business leaders argued the state-run workers compensation system was broken. They cited the auditor s report and pointed to increasing administrative costs, unreasonable time-loss rates and skyrocketing tax increases as primary weaknesses of the staterun monopoly. A proposed ballot initiative (I-1082) to allow the private sale of workers compensation insurance failed in November 2010, and the system continued to slip toward insolvency. Two subsequent reports by the state auditor, in 2010 and 2011, continued to sound the alarm over dwindling contingency reserve funds, with the most recent estimating a 56.9% chance of insolvency in both accounts in the next five years. The 2011 auditor report concluded that future rate changes consistent with long-term averages would leave the system insolvent. It is unlikely the rate changes will be sufficient to keep the combined funds solvent [contingency reserve greater than zero] over the long term. 7 The report indicated that while the workers compensation program would likely have sufficient funds to pay benefits over the next 10 years, in the longer term the funds would run out of cash without appropriate rate actions. 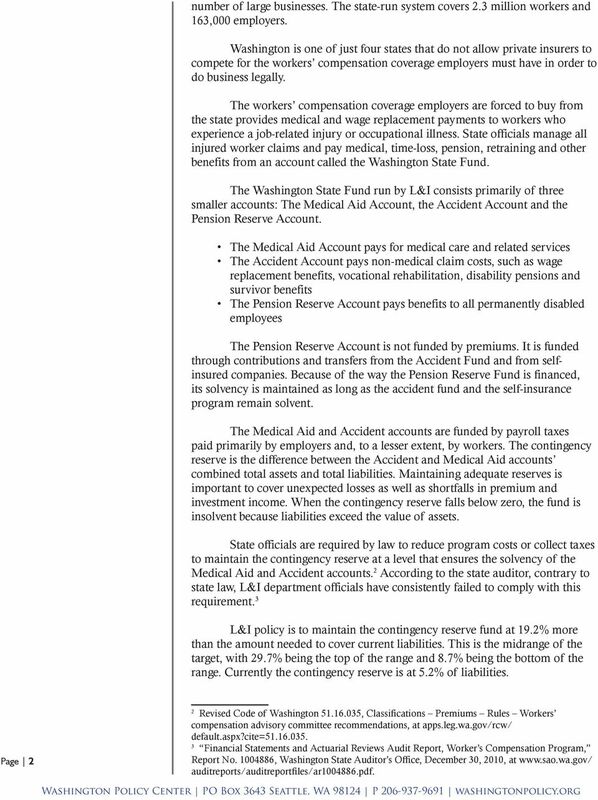 8 Page 3 4 Financial Statements and Actuarial Reviews Audit Report, Worker s Compensation Program, Report No , Washington State Auditor s Office, December 31, 2009, at auditreports/auditreportfiles/ar pdf. 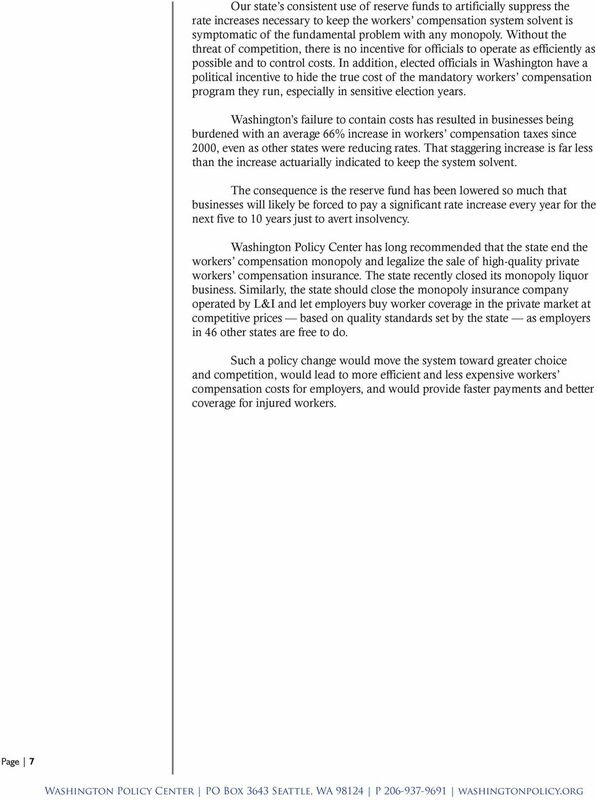 5 L&I: Washington workers compensation system is sound, press release, Washington State Department of Labor and Industries, January 8, 2010, at pr100108a.asp. 6 Ibid. 7 Financial Statements and Actuarial Reviews Audit Report, Worker s Compensation Program, Report No , Washington State Auditor s Office, December 27, 2011, at auditreports/auditreportfiles/ar pdf. 8 Ibid. 6 The workers compensation contingency reserve fund is at 5.2% of liabilities and is predicted to be at 4.9% by the end of the year. This is far below the agency target of 19.2%, and even farther below the national average state fund surplus of 36.5%. 9 Department of Labor & Industries Response The state auditor s warnings are no longer being dismissed and L&I department officials are now considering massive rate hikes to collect up to an additional $3.1 billion. 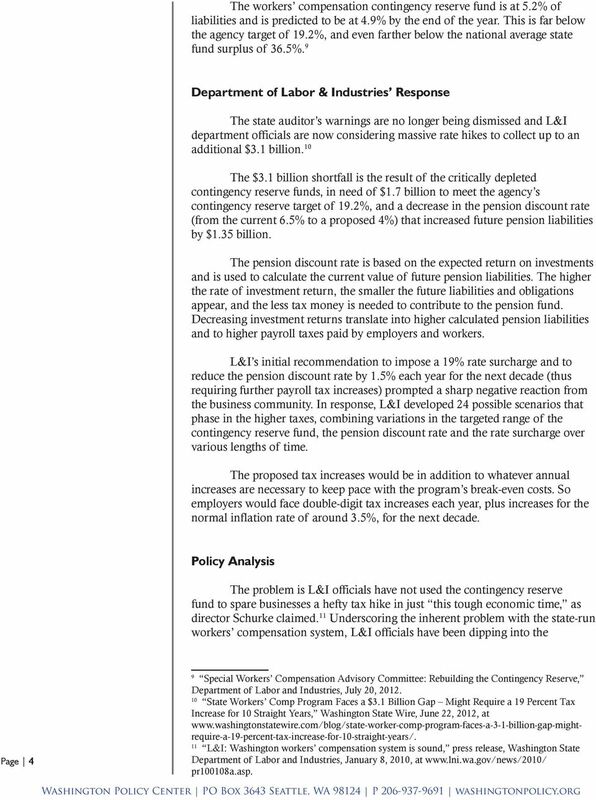 10 The $3.1 billion shortfall is the result of the critically depleted contingency reserve funds, in need of $1.7 billion to meet the agency s contingency reserve target of 19.2%, and a decrease in the pension discount rate (from the current 6.5% to a proposed 4%) that increased future pension liabilities by $1.35 billion. The pension discount rate is based on the expected return on investments and is used to calculate the current value of future pension liabilities. The higher the rate of investment return, the smaller the future liabilities and obligations appear, and the less tax money is needed to contribute to the pension fund. Decreasing investment returns translate into higher calculated pension liabilities and to higher payroll taxes paid by employers and workers. L&I s initial recommendation to impose a 19% rate surcharge and to reduce the pension discount rate by 1.5% each year for the next decade (thus requiring further payroll tax increases) prompted a sharp negative reaction from the business community. In response, L&I developed 24 possible scenarios that phase in the higher taxes, combining variations in the targeted range of the contingency reserve fund, the pension discount rate and the rate surcharge over various lengths of time. The proposed tax increases would be in addition to whatever annual increases are necessary to keep pace with the program s break-even costs. So employers would face double-digit tax increases each year, plus increases for the normal inflation rate of around 3.5%, for the next decade. Policy Analysis The problem is L&I officials have not used the contingency reserve fund to spare businesses a hefty tax hike in just this tough economic time, as director Schurke claimed. 11 Underscoring the inherent problem with the state-run workers compensation system, L&I officials have been dipping into the Page 4 9 Special Workers Compensation Advisory Committee: Rebuilding the Contingency Reserve, Department of Labor and Industries, July 20, State Workers Comp Program Faces a $3.1 Billion Gap Might Require a 19 Percent Tax Increase for 10 Straight Years, Washington State Wire, June 22, 2012, at 11 L&I: Washington workers compensation system is sound, press release, Washington State Department of Labor and Industries, January 8, 2010, at pr100108a.asp. 7 contingency reserve almost every year over the past 12 years to artificially avoid the tax hikes that are inherent in a state monopoly system. In all but one year between 2000 and 2012, L&I professional staff recommended the average rate increase (the actuarially indicated rate) to keep the workers compensation system solvent be significantly higher than the rate the department actually adopted. L&I leaders have routinely used contingency reserve money as a buffer to politically buy down the rate, in some years by more than 24%. 12 The average rate increases adopted by L&I over that 12-year period total 66%, a significant burden for employers, but far less than the rising costs of running the state monopoly program each year. Year Indicated Rate Change Adopted Rate Change % 0% % 12.0% % 7.6% % 3.1% % 3.2% % -2.0% % 0% % 3.7% % 9.8% % 29.0% % 1.8% % -2.2% % 0% So even during the economic boom, the system was failing. L&I managers masked the crisis by using contingency reserve funds to reduce actuarially recommended rate increases. Artificially suppressing workers compensation rates has allowed L&I and those who support the state s monopoly on workers compensation to conceal the program s failings and avoid a well-informed public debate about how to fix the system. Of course the problem could only be suppressed for so long. After years of buying down rate increases, the contingency reserve has been drained to a precarious level that can no longer be ignored. Now, in a weak economy, Washington workers and employers are being forced to participate in a state program that will likely impose years of crippling tax hikes. The Experience of Other States While average workers compensation rates in Washington s state-run program have increased 66% between 2000 and 2012, rates in neighboring states to the south and east have been significantly less burdensome. Page Rate Indication Discussion, Workers Compensation Advisory Committee, Department of Labor and Industries, September 12, 2011. 8 Oregon s workers compensation rates did not increase at all between 1990 and 2011, and employers enjoyed a cumulative rate decrease of 62.8% during that time, with a 17.5% decrease from 2000 through An increase of 1.9% in 2012 is the first rate increase in that state in two decades. 13 Idaho s average workers compensation rates increased just 4.1% between 2000 and Private workers compensation insurance is legal in both Oregon and Idaho. That means employers make the decision of whether to purchase their industrial insurance from the state, to purchase from a private insurer or to self insure based on price and the quality of the coverage. On the other side of the nation, West Virginia began transitioning from a nearly bankrupt monopoly workers compensation system to a competitive system in As a result the state has experienced significant rate decreases. Since the privatization of the workers compensation market, rates have decreased 51.8%. 15 Similarly, Nevada abandoned a failing government monopoly on workers compensation in favor of a competitive system in Since then, rates have decreased by more than 40%. 17 In both West Virginia and Nevada, workers compensation reform resulted in significant improvements in those states workers compensation systems, spurring investment and job creation. 18 Conclusion Employers in Washington state are at a severe competitive disadvantage when it comes to the workers compensation costs they must pay compared to businesses operating in other states, especially those in nearby Oregon and Idaho. Page Workers Compensation Rates / Workers Compensation Rate Graphs, Oregon Department of Consumer and Business Services, at premium_2012.aspx. 14 Idaho State Advisory Forum 2011, National Council on Compensation Insurance, Inc., December 6, 2001, at from Idaho Industrial Commission, copy available upon request. 15 Governor Announces $2.7 Million in Savings to Workers Compensation Premiums, press release, Office of the Governor, June 1, 2012, at pressreleases/2012/pages/governorannounces$27millioninsavingstoworkers CompensationPremiums.aspx. 16 Workers Compensation Gives Nevada Business Incentives, Insurance Journal, September 6, 2005, at 17 Nevada State Advisory Forum 2012, National Council on Compensation Insurance, Inc., March 22, 2012, at from Nevada Division of Insurance, copy available upon request. 18 An analysis of the Impact of Workers Compensation Reform in Nevada A Report to The Republican Governors Association, National Foundation for Unemployment Compensation and Workers Compensation by Pinnacle Actuarial Resources, Inc, December 2005, at horwitz.onelawcompany.com/assets/ BAhbBlsHOgZmIh00ZGJmMTZhMjFkMDNjODVkNmUwMDAwMDU; West Virginia-Positive Change, Positive Results, West Virginia Development Office, at Business%20Climate.pdf. through 2079. The size of the tax increase needed to make the system solvent is a useful way to gauge the shortfall over the 75-year period. Washington s Workers Compensation System Needs Reform NOW! 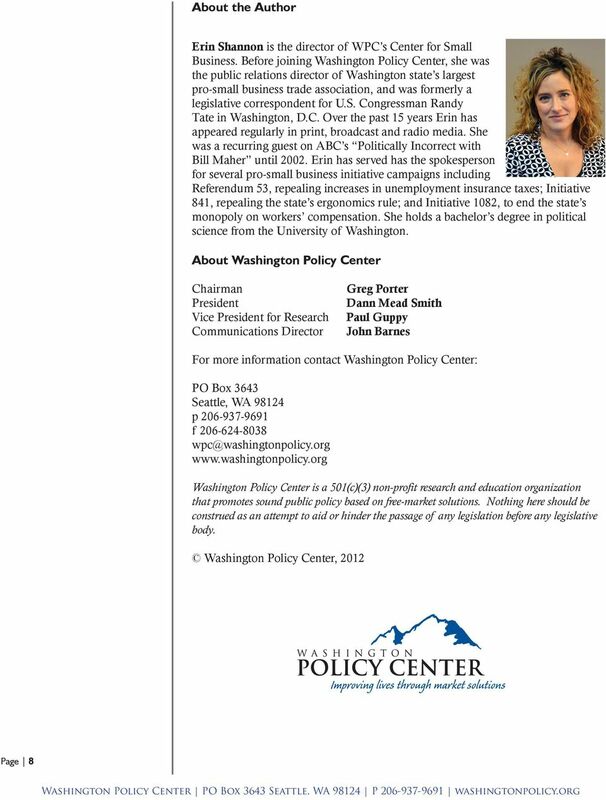 POLICY BRIEF. Citizens Guide to Initiative 1366, the Taxpayer Protection Act. Jason Mercier Director, Center for Government Reform. BACKGROUNDER. Social Security Trustees Report: Unfunded Liability Increased $1.1 Trillion and Projected Insolvency in 2033. Cross Border. Are You Ready to Do Business in the US?